With the weather as crazy as it is today (we got a foot of snow overnight, and there's no signs of it stopping!) 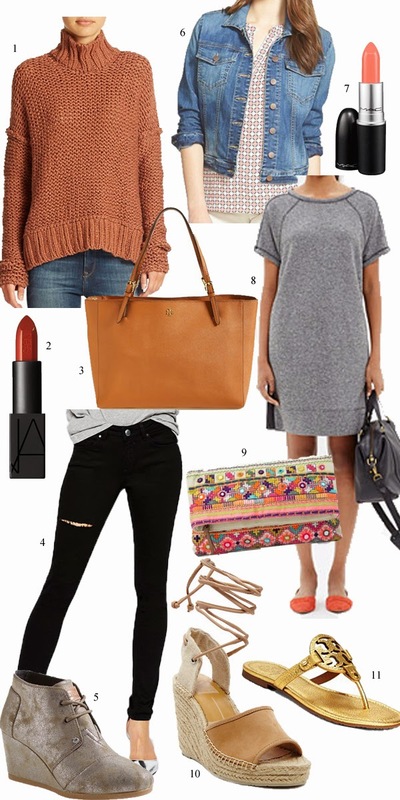 I couldn't decide whether I wanted sweaters and booties, or cute dresses and sandals as I've been doing a little online shopping, so today's wishlist has a little bit of everything! We have the lovely wintery outfit on the left with a beautiful dark lip color, and the fun springy look on the right with a bright fun clutch. So wherever you may be and whatever the weather may be like, there's a little something for everyone, because at the end of the day, I kind of love it all! PLUS: The rust colored Free People sweater and the adorable Dolce Vita Espadrilles are 25% OFF with the code FRIENDS and Lord & Taylor AND this Madewell dress is only $39.99! I can't handle. Enjoy loves and don't forget to check out more of my favorites below! lovely wish list! my favorites are the sweater and the dress, but it's all good inspiration!